Putrajaya (13 October 2017) – In line with Jabatan Agama Kemajuan Islam Malaysia (JAKIM)’s efforts under the National Blue Ocean Strategy (NBOS) framework to meet the rapid growth of halal industry in Malaysia with faster Halal certification process, Halvec Laboratories Sdn Bhd (Halvec Laboratories) was honoured to be appointed as Halal Panel Lab. The appointment was officially commemorated in the Signing of MOA between JAKIM and Halvec Laboratories held at Putrajaya on 13 October 2017. The appointment of JAKIM halal panel lab is intended to speed up halal certification process by JAKIM and the recognized Halal Panel Laboratory shall conduct the analysis on samples to support the assessment of halal certification. Halvec Laboratories, among other laboratories, was successfully being nominated via meeting all approved requirements such as the Syariah, technical and other requirements listed by team of auditors which consists of experts from Standards Malaysia, Department of Chemistry and Malaysia Halal Analysis Centre (MyHac). The technical requirement selection scope for Halvec Laboratories is covered under DNA (Deoxyribonucleic Acid), which is one of the core strength of Halvec in halal analysis. 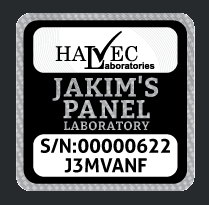 “It’s a great achievement for Halvec Laboratories being approved as one of the panel laboratory by JAKIM this year,” said Chief Executive Officer (CEO) of Halvec Laboratories Sdn.Bhd., Mr. Nor Amin B. Mohd Noor. In the same ceremony, JAKIM also appointed ALS Technichem (M) Sdn. Bhd. as another panel lab under technical requirement scope of alcohol analysis. Both Halvec and ALS Technichem are to cover the critical analysis under Halal Science parameter and to assist the rapid halal certification process for industries and consumers. With a team composed of 10 competently trained and experienced researchers and analysts, Halvec Laboratories has vast experience and competency in providing lab technical analysis and handling varieties of samples to verify halal integrity which is critical in Halal certification process. Halvec Laboratories has been investing resources in expanding technical capacity and competency and highly focusing in developing comprehensive and reliable analytical methods for all scope of samples with the highest level of integrity and service level to our customer. “With international recognition, experience and capacity of Halvec Laboratories, we will be continuously working closely with government and industry players in realizing the vision of JAKIM and Malaysia to become the world reference of Halal,” said Mr. Noramin.